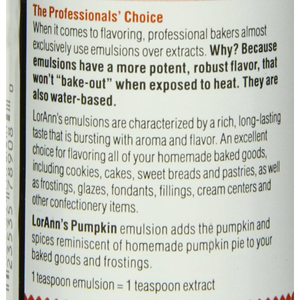 LorAnn Pumpkin Spice Baking Emulsion--better than an extract. Water based instead of alcohol based so the flavor won't bake out. 1 teaspoon extract = 1 teaspoon emulsion. Gluten free, soluble in water. 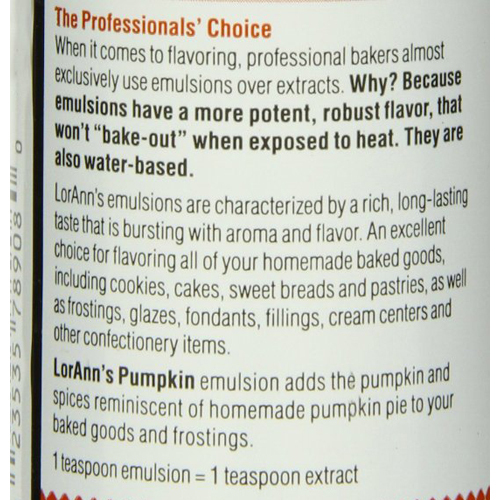 Try LorAnn's Pumpkin Emulsion in any of your baked goods such as recipes for cakes, muffins, cookies and sweet breads for delicious pumpkin pie-spiced flavor. Emulsions are water-based alternatives to extracts. The flavor is micro encapsulated in natural stabilizers and suspended in water. The encapsulation enables the flavor not to lose its integrity when exposed to high heat. That means emulsions give better results than extracts. 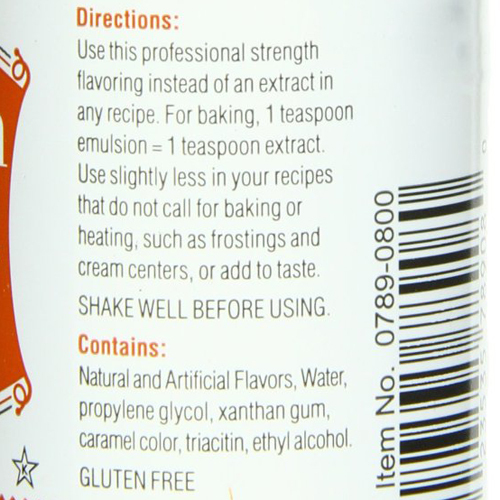 Emulsions are almost always the professional bakers' flavor of choice over alcohol-based extracts. Emulsions have a more potent, robust flavor. They won't "bake-out" when exposed to heat. Use emulsions to flavor cookies, cakes, sweet breads and pastries, frostings and glazes, fondants, fillings, cream centers and other confectionery items. If your recipe calls for 1 teaspoon extract, substitute 1 teaspoon emulsion. Use slightly less in recipes that do not call for baking or heating, such as frostings or cream centers, or add to taste. 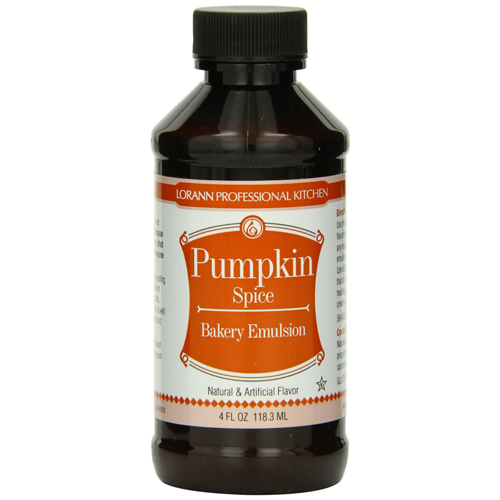 Great flavor and perfect for baking Perfect flavor for adding that pumpkin flavor to all baked goods.